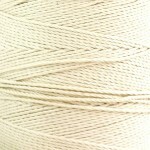 100g cones of very strong, smooth cream (undyed) pure cotton in a range of thicknesses with a best twist. Lancashire is a very strong, high quality, high twist pure cotton yarn available in three different thicknesses. 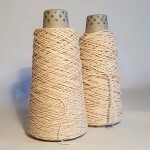 It has a “best twist” as it is made from multiple ends of fine, smooth cotton twisted together and then back on themselves. This is a very time-consuming production method, but creates an exceptionally strong, smooth yarn and adds to the strength and appearance. 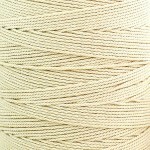 As it’s so strong the cord is suitable for weaving in the warp, macrame and other heavy duty projects. 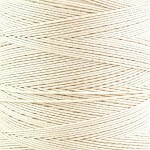 It is the ideal warp yarn for tapestry looms, table and floor looms and tablet weaving looms. Excellent for knotting crafts and will create very tough braids and tassels. Lancashire can be knitted and crocheted and would make very strong and robust bags, bowls, boxes, pouffes or floor cushions. Makes a really useful all round string when a picture needs re-stringing or a strong string in the garden is required. The cord can be dyed with cold water dyes to transform it to your own colourways. As the cord is quite dense it might not dye quite as quickly as other cotton yarns as the pigment may struggle to penetrate through the twists, but should eventually give good results. The cord is regularly available, is a brilliant price (especially compared to piping cord per metre) and really versatile.